"Bhagavân Srî Sathya Sai Baba" is how Baba is referred to by the millions that adore Him. He announced Himself as Sai Baba when He spoke of his identity at the age of 14, on 23rd May, 1940, when his father insisted on being told what Baba meant by saying that He had His disciples to look after and His unfinished work to be completed [see for this story 'The serpent hill']. "Sathya Nârâyana" was His Name and Raju was the family appellation. This was shortened into Sathya, the name by which Baba was known at home, village and school. 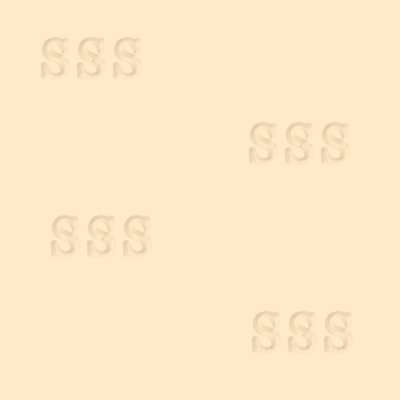 To the name announced by Baba Himself - Sai Baba - was added the word 'Sathya.' 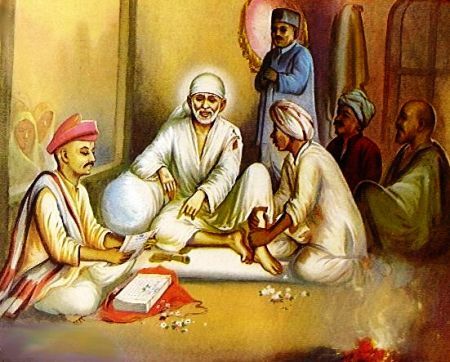 Five or six years later after the announcement, the devotee who desired to distinguish Him from Sai Baba as He had manifested Himself at Shirdi, realized that Baba Himself was the Shirdi manifestation. But they did not wish to confuse the minds of those who loved to cling to the memory of Shirdi 'Baba'. Baba is the word used in Marathi and in Hindi to refer to saints. It means 'Father'. 'Sai' is the name by which Baba had been spoken to by the priest of the Khandoba temple near Shirdi, when He arrived there as a youth. 'Sai' means 'Master'. It is a derivate of the Sanskrit word Swami. The word 'Sai' has also been traced to the Persian word Shah, Shahi, Sahi, Sai. Baba's Aiswarya or authority derived from power is self-evident. Masters of special branches of study like doctors, lawyers, engineers and artists acknowledge Him as their master in their respective fields. For He can correct them and give them invaluable help. Fame and prosperity follow Him wherever He goes, though He has never cared for either. As for bravery, wisdom and detachment, thousands who have known Him, know Him as the embodiment of these qualities. It is laid down in the Sastras that only those who have mastered the six primary mysteries can be referred to as 'Bhagavân'. the mystery of their doom and their redemption and of their ignorance and wisdom, is alone to be spoken of as Bhagavân." "I know all that happens to all because I am in everyone. This current is in every bulb. I illumine every consciousness. I am the inner Motivator in each one of you." "Even if the fourteen worlds in the upper and nether regions of the universe unite in order to delay or disrupt the work for which I have come in this Body, it will not suffer or falter." "No Avatâr has done like this before - going among the masses in the villages, seeking out the distressed, waking up the sleeping, quickening the dull, showering grace on millions and counselling, consoling, guiding, uplifting them along the path of Sathya (truth), Dharma (eternal principals), Santhi (peace) and Prema (love). I am neither Guru nor God. I am you! You are me! That is the Truth and you will realize it when you reach the goal. You are the waves and I am the Ocean." "There is no mesmerism, miracle or magic in what I do! Mine is genuine Divine power. Small minds and limited intellects are too weak to perceive the Divine. The Divine magnificence is too much, and too overwhelming for their maya-filled eyes. And so they ridicule it and call it the result of Yoga Siddhi, mesmerism or magic. But the Divine can do anything. He has all the power in the palm of His Hand. His powers are not such as would abide for a time and then fade away." "The man who dies prays to Me to receive him. The relations who lament the loss pray to Me to prolong his life! I know both sides of the picture, the past and present, the crime and the punishment, the achievement and the reward. And so I am just, modifying the sentence now and then with Grace. I am not affected in the least by the birth of this one or the death of the other. My nature is unalloyed Bliss." The word 'Bhagavân' also means 'blissful'. The Vishnu Purana says that the syllable 'Bha' means 'the cherisher and supporter of the universe,' 'Ga' means 'the leader, the impeller or the guide' and 'Va' means 'that elemental spirit in which all beings exist and which exists in all beings'. This 'Va' is also to be found in the name of Vâsudeva which was the name that Baba said was His own, when He was at Shirdi. Gunaji says in his biography of 'Shirdi Baba', page 103: "Baba said that He was omnipresent - occupying light, air, water, world, land and heaven - and that He was not limited. He said, 'I always live everywhere. I have no form. I require no door to enter.' - page 155. In his present incarnation too, Baba entered Swami Abhedananda's room in Ramanashram even when the door was bolted in order to assure and illumine the monk and accept him as a disciple. He also entered an operation theatre in a surgical home in Bangalore in spite of bolted doors, for blessing the patient when a prostrate gland operation was going on. Sanskrit classical text also give other definitions of 'Bhagavân.' The Saranagathi Gadya says, "Bhagavân is He who is boundless Bliss, Bliss that rewards every being in the universe. The Gadya goes on to say that a Bhagavân must have an extraordinary knowledge of all the mysteries of the world, dominion over all the forces of nature, power, splendour, gracious manners, affection as of a mother, softness and compassion, rectitude and uprightness, comradeship, impartiality, mercy, nobility, generosity, skilfulness in strategy, heroism, dash and enthusiasm, steadiness in truth, and all other good qualities. Dr. Gokak [see SSS-II - 'Cities Aflame'] is never tired of pointing out that Baba is, more than anyone else, power, dominion, majesty and splendor. It is this element of power that, among other things, distinguishes an incarnation from a saint. Baba's scholarship is overwhelming. With hardly any formal education, He has on the tip of His tongue, atomic formulae, Vedic hymns, medical recipes, and Tantric mantras. Sri Aurobindo has said, "Each incarnation holds before men His own example and declares of Himself that He is the way and the gate: he declares too the oneness of His humanity with the Divine Being." "You become Bhagavân as soon as you express the Atma principle. Each one of you can become Bhagavân by merging your separate individual Jiva or self in the ocean of universal Atma." The word Avatâr means 'descent, coming down, alighting'. This is the limitation that the limitless imposes on itself, in order to lead mankind. In a discourse on Shivarathri a few years ago, Baba recited a verse, such as He is used to composing and reciting at the commencement of a discourse, in which He recounted the aims and purposes of His own Avatâr at Puttaparthi. He has declared that He is the Divine Essence that is known and worshipped in many Names and Forms all over the world. In his 'Essays on the Gîtâ,' Sri Aurobindo has analyzed the role of an Avatâr; "The Avatâr comes as the manifestation of the Divine nature in the human nature, the apocalypse of its Christhood, Krishnahood, Buddhahood, in order that human nature may, by moulding its thought, feelings and action, on the lines of that Christhood, Krishnahood, Buddhahood, transfigure itself into the Divine. The Avatâr is always a dual phenomenon of Divinity and humanity. The Divine takes upon Himself human nature with all its outward limitations... The object of the Avatâr's descent is to show that human birth, with all its limitations, can be made a means and an instrument of the Divine birth and Divine Works." "If I had come as Nârâyana with four arms, they would have put me in a circus, charging money for people to see Me. If I had come only as man, like any other man, who would listen to Me? So I had to come in this human form but with more than the human power and wisdom." Baba's call to suffering humanity stands out in its directness and simplicity: "Why fear when I am here? Come unto Me all ye who suffer!" Baba assures us, if we take one step towards Him, He takes ten towards us. He hears us when we cry out in anguish. As the Gîtâ declares, "the hand and the feet, the eyes and the ears, and the head and tongue of the Divine are everywhere to help us and save us and lead us to the Divine, when we have a sincere desire to ascend to the Divine." Thirodhana - or the power to make things disappear. Anugraha - or grace which may be of two kinds, grace for the deserving and grace conferred regardless of the recipient deserving it, like a bolt from the blue. Again, He is ever-present where His Name or Nama is uttered and where His Rupa or form is recognized. The Vibhuti that falls from Baba's portraits in different parts of the world itself shows how His Rupa or form brings us into contact with Him if He is remembered. As an example of a concrete presence where the Name and Form are remembered I may quote from a letter written by the Cowans of Orange Country, U.S.A: "In our home, we have a small room filled with the pictures of our great Lord Sathya Sai Baba. It is here we meditate before retiring. Many times, people of the Sai family drop in, and pray. Each night, we watch for Vibhuti to manifest, but so far, none has appeared. It was about a month ago some friends who are devotees of Sathya Sai Baba came to meditate with us in His room. I wish to say that the fragrance of this room has a beautiful odor, as if hundreds of flowers were giving forth their blooms to us. This is one of the gifts the great Swami bestows on us. Our friends were amazed at the sweetness of the room." "We all sat down around the small altar and gave admiration to the picture! And, behold! Upon a large colored picture of Bhagavân Srî Sathya Sai Baba a sapphire star had appeared, with eight rays, manifesting from it, as if it was a necklace, with a gem, at His throat centre! The word travelled fast and many of the Sai family have come to see the miracle of the Lord." In many thousands of homes and public prayer halls in India, Africa, Ceylon and other countries, Baba has willed the devotees to get the sacred curative Vibhuti from the portraits hung on the walls. There was Vibhuti at the shrine in the home of the Cowans too. Here is an account given by a sceptic of his visit to the shrine in the home of Cowans. The visitor's name is Joel Riordon, a hollywood writer of film scripts: "My wife mentioned to me that a picture in the house of the Cowans was producing ashes! She immediately walked away. Now, she did it... dangled a bit of curiosity in my path, curiosity that I couldn't resist. Sunday morning I was ready for the challenge... When we arrived at the meeting after following Mr. and Mrs. Hislop's car for over one hour, I thought there is a church three miles from my house, and I won't even take the time to go there. What am I doing here?... At the meeting, voices rang out, as they were clapping to the rhythm of a chant: there was a speech by Jack Hislop about a letter he received by mail from Sai Baba and the mystery - how it arrived without a stamp! 'So the stamp dropped off in the mail man's bag,' I thought. I am certain there was more to the story, but my mind was on the picture. Where is it? Why can't I see it now?... Finally, the moment came; we were allowed to go into another room where a shrine had been set up, with Sai Baba's picture - and it was producing ashes!" "I tried not to be conspicuous, but I must have been because as I approached the picture, looking at it from all angles, from the front, top and back, (I even pretended to tie my shoes, to see under the table; to see if I could find out what trick caused this ash-flow), I saw the hostess talking to two young boys, and as the three of them stared at me, I had the feeling they were expecting me to steal the picture, or something in the house. I immediately departed with a guilty look." Sri J.P. Maroo writes, "I have a family astrologer who belongs to Nepal. He remembers and can recite and quote from the 15.000 verses of the ancient astrological cyclopedia, called Bhrgu Samhitha! Last October, that is to say, in 1967 he came to see me before returning to Nepal, and I requested him for information about some outstanding event that may occur in the near future. He consulted the Samhitha and recited a verse, which said that on 4th November, 1947, I will have Pratyaksha Deva Darsana! (the Darsana of God in concrete Form!) And, it happened as forecasted! Baba came to Usha Kiran, to my home, and accepted my worship on 4th November, 1967." Speaking to a group of seekers from San Francisco in the USA and from Ceylon in June 1970, at Brindavan, Whitefield, Baba said that the Divine is as eager to be one with individual soul as the individual is eager to merge with the Divine. He said that this was a gradual process, very much like what happens to stalactites and stalagmites in limestone caves. One of these is formed in the roof pointing downwards and the other on the floor pointing upwards. The formation on the floor is due to the deposit of something like one drop in a thousand years from the stalactite in the roof pointing downwards. Baba was demonstrating how this happens with the use of His fingers. He was a little dissatisfied with this demonstration Himself. He then waved His hand in a very long, flat and circular motion and materialized a round black stone, the weight of which made His hand vibrate like a tuning-fork. The stone was round in shape, slightly flat at the top and bottom and it bore no marks on it. It was smooth and shiny. Baba lifted it, held it a few inches away from His mouth and blew a hole into it, with sovereign ease and grace. This hole appeared like two intersecting circles. The place of intersection was wide open and the two circles were touching each other with concentric rings that bore in towards the centre, and were trying to merge into each other. Baba used this stone to illustrate His point and then gave it to a sadhak in the group, named Gill. About a year later Gill happened to show it to some Indian friends in Juhu, Bombay. They told him, to his utter astonishment, that the stone, with the imprint blown on it was a fossil called Saligram and that it was used by Hindus for worship. Howard Melvin, a member who happened to be one of this group told me about this interesting incident. Another fact that sets us wondering regarding Baba, is the many-facetedness of His personality. One sees in Him a paragon upon which each one models himself. The manager of a mighty manufacturing concern sees in Him an ideal organizer and manager. A doctor sees in Him the perfect master of diagnostic and medical skill. An engineer or architect finds in Him the master who humbles their pride with a blue pencil and fills their heads with ideas and designs, any one of which can make a fortune for them through its beauty and practicability. A musician finds in Baba the primal source of melody and harmony. When someone praised Baba for his musical talent and compared Him favourably with Thyagaraja, Baba asked him. "And who do you think taught Thyagaraja music?" Baba is the poet of poets. Not only is He Himself an inspiring theme; His conversation and charm release in the poet springs of inspiration hidden away for a long time (see 'poets meet'). A philosopher can learn from Baba the art of laying bare enigmatic thought-processes in a simple and straightforward manner. A painter of genius meets his challenge in the ever-varying expressiveness of His face and eyes. An actor learns from Him those subtle inflections and intonations of the voice that best express the soul. A trained teacher finds a master of profoundly new methods in Baba. As the Gîtâ says, "The Divine is the best, the mightiest, the most charming, the wisest, the highest and the most intricate Being; an incarnation of the Divine bears this stamp on its personality. "[***] Baba asked Schulman; "How can a fish understand the sky?" He also remarked elsewhere, "I am all deities in one. You may endeavor your best for thousands of years and have all mankind with you in your search, but you cannot understand My Reality." We find in Baba the integral manifestation that combines these three roles. He is the great teacher, far-famed for His simple and sweet exposition of Vedanta today. He is the great dispenser of love or Prema. Finally, He is the great restorer of the essence of spirituality to mankind. We may say of Baba what Prof. P. Shankaranarayanam says in his book 'Srî Râmacandra': "For man to receive God's stimulus and to make the responses, God must become a person in flesh and blood, Human in His Divinity, and yet Divine in His Humanity. To infinitise man, God has to finitise Himself." The person who reads this book about Baba and the two preceding parts in the series is sure to experience an impact which will not allow him to be the same again. He will have to take up the challenge and prove it or disprove it to himself for his own satisfaction, if he is in earnest about the view of life presented in this book. Baba can dismiss a cancerous growth by saying. "The cancer is cancelled." He can extinguish forest fires around the Kuchuma Mount on Mexican border by a declaration made at His ashram in India, "No more fires!". He can create a jar of sacred ash which can never be exhausted by use, and the gift of spiritual ecstasy by a simple touch. He knows each one's past and future. [Gîtâ 7.26] He says that we are the same as He is. It is simply our delusion that we feel we are different. The Publishers Weekly wrote about Arnold Schulman's book, 'Baba': "Sathya Sai Baba calls Himself an Avatâr, an Incarnation of God, His followers who number over six millions, come to His ashram at Puttaparthi in Southern India to sit at His feet, sing their prayers and ask for miracles. Baba answers their prayers: He cures the incurable, materializes objects and holy ashes, sustains the faithful and convinces the doubtful." There is no inner circle or outer with regard to Baba's devotees. All mankind is His fold. Numberless persons have been drawn by Him, away from low desires and passions, from fanatical and cynical attitudes. The Name 'Sai' will soon be embellished in every heart. 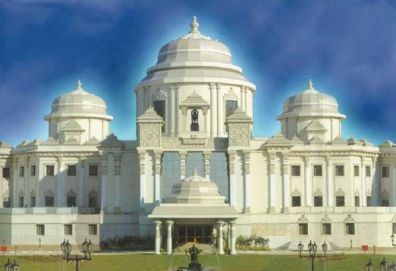 Prasanthi Nilayam is His Ashram at Puttaparthi, the village which He has immortalized by deciding to be born there. As He always says, "My residence is in your hearts. My Prasanthi Nilayam is in you." Baba's Bhajans have penetrated into numberless homes and led to the itinerant singing in cities, waking up the hearts of men to the glory of God. Baba can be adored in all forms, and addressed by all the names that God bears. One sees in Him the power that works as the effulgence of the transcendent ray that beams beyond cosmic laws. He calls us near and wipes our tears of sorrow in spite of our faults and failures. He declared in 1962 that the Chinese menace would not be there at the time of the Birthday Celebrations on November 23. It is a fact that the Chinese retreated beyond the Himalayas on the night of the 22nd November. In 1965, when every one thought that the Dasara celebrations should be postponed in view of the Pakistan invasion, Baba declared that the Dassara celebrations should be postponed in view of the Pakistan invasion, Baba declared that the Dasara celebrations should be held as usual. As a matter of a fact, a cease-fire was ordered and accepted three days earlier than Dasara. 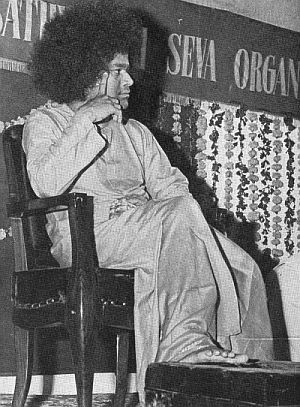 The Fifth All India Conference of the Sathya Sai Seva Samithis had been fixed in Madras to take place on 22nd and 23rd December, 1971. There were frantic telegrams whether the Conference was postponed, for Pakistan bombed Indian airfields on 3rd December. The events that followed seemed to predict that there might soon be a global war. Baba said that there would be no war and that the Conference should be held as planned. The war came to an end of the 17th December,1971. Baba is the indweller in each human heart. He gathers people around Him day after day and deals with them in love and compassion. Physical illness, mental worry, psychic disorder, economic want, family discord, intellectual deficiency, professional setback; He handles each problem as it comes with unfailing skill. He gives holy ashes because that is the ultimate form that things take - Alexanders, Napoleons, Hitlers their ambitions and their empires. That is how He teaches us the lesson of detachment. He cures us of greed and hatred by reminding us of the ultimate fate that awaits all earthly pomp and glory. That He is all knowing, even a sceptic like Schulman was compelled to admit when Baba mentioned to Schulman his visit to Japan to study Zen Buddhism and other details. Schulman thought that Baba was parading information that He had collected from Dr. Gokak about him. Sensing this the very minute, Baba told Schulman that Gokak had given Him no information. He proceeded to refer to a certain ailment of his wife which no one else had known. He told him that it was Baba who had brought about the disappearance of this ailment a week before he boarded the plane for India so that he could come to India in time. Baba is an open book for all to read. He is the Guide as well as the Goal. [*] Bhagavad Gîtâ: Chapter 7, verse 26: 'I know all of the past, the present and, O Arjuna, the future as well of all living beings, but Me nobody [really] knows'. Bhagavad Gîtâ: Chapter 9, verse 11: 'The foolish look down upon My having assumed the human form, not knowing of My transcendental nature and that I am the Great Lord of all'. [**] Bhagavad Gîtâ: Chapter 4, verse 7: 'Whenever and wherever it is sure that one weakens in righteousness and a predominance of injustice does manifest, o descendant of Bharata, at that time I do manifest Myself'. Bhagavad Gîtâ: Chapter 4, verse 9: 'Anyone who knows as such of my divine birth(s) and activities will never, after leaving his body, take birth again, but will attain Me, O Arjuna'.